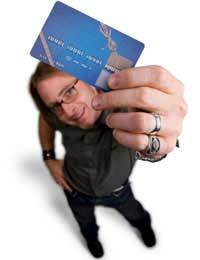 Home > Cards & Charges > Debit or Credit Card? When it comes to debit and credit cards you must understand the differences before you choose which one is suitable for you. If you look back over time it is relatively easy to spot the differences between the two types of cards. The debit card was used to get cash out of an ATM by using your Personal Identification Number (PIN) and a credit card was used to carry out transactions in a store or on the internet. However, this has all changed and both cards now look very similar, can be used at a checkout and for online purchases. The main difference is simply that when you use a debit card, the money is taken from your bank account instantly. However, with a credit card you are spending money you don't necessarily have and will receive a monthly bill. The main problem here is that if you fail to repay the amount that you owe, or if you withdraw cash, you will incur charges - usually quite high charges. First of all lets look at debit cards. These are linked to your bank account directly and you can use them to withdraw money, purchase items over the counter or online and the transaction amount is taken out of your account straight away. There is also the option to use your debit card to get 'cashback'. This is offered by some stores, when you get to the counter and pay by debit card you can request money from the cashier which is then added to the amount of your purchase and the total is deducted from your account. Depending on which type of debit card you have will determine whether the transaction will go through if you happen to not have enough money in your account. For example, if you have a Solo or Electron card, your account is checked every time and if there isn't enough money in there the transaction will be declined. If you have a Visa, Switch or Delta card, on the other hand, your account balance isn't necessarily checked each time and the payment could go through even if you don't have the funds to cover it. Credit cards are set up differently than debit cards in that they allow you to 'buy now and pay later', otherwise known as buying on credit. These cards aren't linked to your bank account, but like debit cards, they can be used in stores, online or over the phone to purchase goods. You must be careful, however, if you do decide to opt for a credit card because if you fail to repay the outstanding balance you will be charged and these can be pretty hefty. Also, the Annual Percentage Rate (APR) on credit cards can be very high so it is important that you shop around for the best deal before applying to a provider. The other thing to remember is that if you take money out from an ATM you will be charged a daily interest rate until you pay your bill at the end of the month. Many credit card holders don't realise this and get a nasty shock when they take a look at their bill. The main problem with a credit card is that your debts can quickly spiral out of control and leave you in a serious situation. You must carefully consider all of your options and shop around for the best deal that suits your needs before you decide to take out a credit card.